I am looking at building an outdoor kitchen. The idea is to have a shed type roof attached to the house and sloping out and down at a low angle about 18 feet wide and 12 feet deep (from house to end of roof). My Large and Medium BGEs are planned to be mounted in a counter against the house about in the middle of the 18ft wide roof area. I have a screen porch to the left and its open air to the right. The roof will be about 9 1/2 feet tall where the BGEs sit or about 6 1/2 feet above the cooking surface of the BGEs. My question is can I push the smoke from the BGE out from underneath the roof to the right and the open air effectively with fans mounted on the ceiling? I wish I'd have put two fans in my space, but they are mostly for cooling and pests. Mother nature tends to over power the ceiling fan, but when it does it still disperses. When it's still, the single fan keeps smoke from accumulating. Mine aren't against the house but more under the eaves. I would install an outdoor-rated stainless exhaust hood over the eggs and vent it through the roof. My uncle had the type of setup you propose with 2 ceiling fans and a box fan and still wouldn't clear the smoke. Exhaust hoods are very expensive and may create a noise or rattle in duct work. You could put some surface on ceiling that you could clean maybe stainless or some other material. The smoke rising will carry small particles of grease that will accumulate over time. A fan mounted to blow it away would help keep build up down. @VanDawg38, very nice setup. Did you do the work yourself or hired it out. We have an 18'x24' patio, that gets good shade in the early morning and late afternoon, but something like this would be even better. I agree with @PatsFan70 - the hood would be the best way to go. Overhead fans will keep the smoke from accumulating, but won't vent it out well. Then if you point a fan directly at the eggs, you'll effect the fire/airflow. Thanks. I pulled in some favors to DIY the cover, electrical and plumbing. Without a lot of help, I never would have gotten those trusses up. Paid for the brickwork and counters. Total covered area is about 17'x34'. 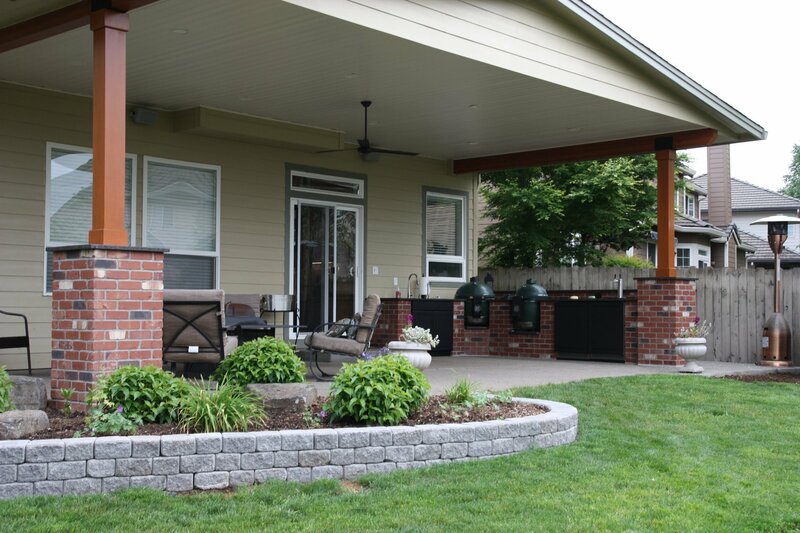 Nice looking outdoor kitchen. I have a sink left over from remodeling the home kitchen and some left over Trex boards. I have a medium BGE and will use the standard table design with work space between the BGE and sink. I want to use the Trex for the work space and trim on the sink and cooler. I plan on using oven tiles between the BGE and workspace. My question is how much space needs to be between the BGE and the Trex?